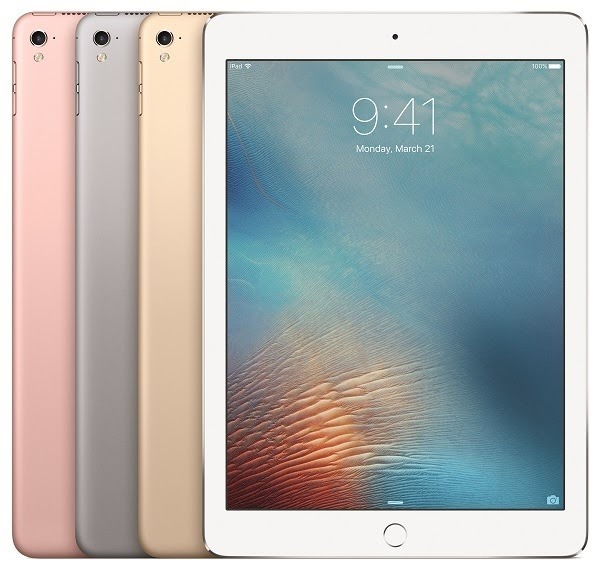 Apple introduces 9.7-inch iPad Pro. Apple today introduced the all-new 9.7-inch iPad Pro - at just under one pound it features a new pro Retina display with greater brightness, wider color gamut, lower reflectivity, Night Shift mode and introduces new True Tone display technology to dynamically adjust white balance. The new iPad Pro delivers incredible performance with the 64-bit A9X chip that rivals most portable PCs, along with a four-speaker audio system that is twice as powerful, new 12-megapixel iSight camera for shooting Live Photos and 4K video, 5-megapixel FaceTime HD camera, and faster wireless technologies. And iPad Pro includes support for the breakthrough Apple Pencil and a new Smart Keyboard cover designed to fit the new 9.7-inch iPad Pro. The 9.7-inch iPad Pro features advanced display technologies, including a True Tone display, which uses new four-channel sensors to dynamically adjust the white balance of the display to match the light around you for a more natural and accurate, paper-white viewing experience. The advanced Retina display is 25 percent brighter and 40 percent less reflective than iPad Air 2, making content even easier to see indoors and out. It uses the same wider color gamut as the iMac with Retina 5K display, delivering 25 percent greater color saturation for more vivid colors. A custom timing controller, photo alignment and oxide TFT deliver incredible color, contrast and clarity. Night Shift in iOS 9.3 uses iPad Pro's clock and geolocation to automatically adjust the colors in the display to the warmer end of the spectrum after dark and may even help you get a better night’s sleep. The four-speaker audio system provides powerful, clear and rich stereo sound for more than twice the audio output. Built-in sensors automatically adjust and optimize the audio no matter which way you're using it. iOS 9.3 also adds support for playing video encoded with Dolby Digital Plus audio streams with support for multichannel output using the Apple Lightning Digital AV Adapter. Apple Pencil and Smart Keyboard, available for purchase separately, bring breakthrough levels of precision and utility to iPad Pro. Advanced sensors in Apple Pencil measure both pressure and tilt for a natural drawing, annotating and note-taking experience. A new Smart Keyboard is custom-designed for the 9.7-inch iPad Pro, offering a thin yet durable keyboard that never needs to be charged or paired over Bluetooth and is easily foldable into a protective Smart Cover. The new Lightning to SD Card Camera Reader and Lightning to USB 3 Camera Adapter make it easy to download photos and videos from a digital camera to iPad Pro, while a new Lightning to USB-C Cable and Apple’s 29W USB-C Power Adapter enable faster charging. + The 9.7-inch iPad Pro comes in silver, space gray, gold and a new rose gold metallic finish, and starts at $599 (US) for the 32GB with Wi-Fi model and $729 (US) for the 32GB Wi-Fi + Cellular model. Both iPad Pro sizes are available in offerings of 32GB, 128GB and a new 256GB capacity, the highest of any iOS device. For more information, please visit www.apple.com/ipad. + The 9.7-inch iPad Pro will be available to order beginning Thursday, March 24, from Apple.com, and in Apple's retail stores, through select carriers and Apple Authorized Resellers on Thursday, March 31, in Australia, Canada, China (Wi-Fi models only), France, Germany, Hong Kong, Japan, New Zealand, Puerto Rico, Singapore, the UK, US Virgin Islands and the US. + Apple Pencil is available for $99 (US) and Smart Keyboard in charcoal gray for $149 (US). The Polyurethane iPad Pro Smart Cover and Silicone Cases for the 9.7-inch iPad Pro are available for $49 (US) and $69 (US), respectively, in a range of new vibrant colors. + The Lightning to SD Card Camera Reader is available for $29 (US), Lightning to USB 3 Camera Adapter for $39 (US), Apple 29W USB-C Power Adapter for $49 (US), Lightning to USB-C Cable (1 m.) for $25 (US) and Lightning to USB-C Cable (2 m.) for $35 (US).